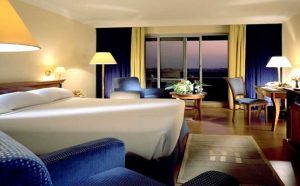 Nicon Luxury is a top-class hotel sets against the dramatic backdrop of Aso Rock, Abuja – it is at the centre of the Federal Capital Territory. 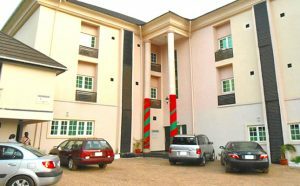 The hotel came into being as a result of Nigeria’s hosting of the December 2003 Commonwealth Heads of Government Meeting and was privileged to accommodate members of the Commonwealth Business Forum. The hotel’s location in the heart of Abuja provides easy access to key sites such as the Abuja International Conference Centre with access gates from the hotel and the IBB International Golf Course which is 5KM from the hotel. Exercise in lavish surroundings at the hotel’s magnificent outdoor pool, three tennis courts, squash courts, and sophisticated gym facilities. Afterward, re-energize at one of Nicon Luxury, Abuja’s 3 restaurants and bars, serving a variety of international favorites and local specialties. 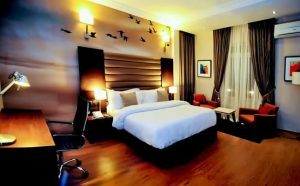 Comfortable luxury, spacious and tastefully decorated rooms with a private balcony. 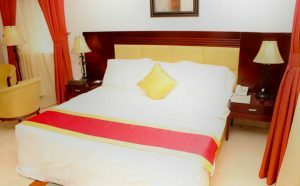 Tastefully decorated and cosily furnished rooms offering deluxe facilities with mini-bar. A relaxed elegant one-bedroom suite with a dining space, equipped with Sat TV, Internet etc. Sophisticated one-bedroom suite with flat screen TV & dining area etc. Tel: (234) (9) 461 9000. On arrival at the Nnamdi Azikiwe International Airport Abuja, you can take an airport taxi directly to Nicon Luxury. The hotel is a short distance from the airport.